Warnings are done to prevent us from danger. Sometimes people ignore warnings and go on with their ways acting like they are smarter than anyone. Sometimes people tend to learn and feel regret when they are already hurt instead of taking warning and advice for their own good. A teenage guy from Odiongan, Romblon had learned his lesson the hard way when he nearly got blinded when the battery of his smartphone exploded on his face while he attempted to remove the battery while it is charging. "Totoy", real name withheld, said that he was thinking that he will go blind for the rest of his life due to the damage of the blast inflicted by the charging mobile phone on his face and eyes. 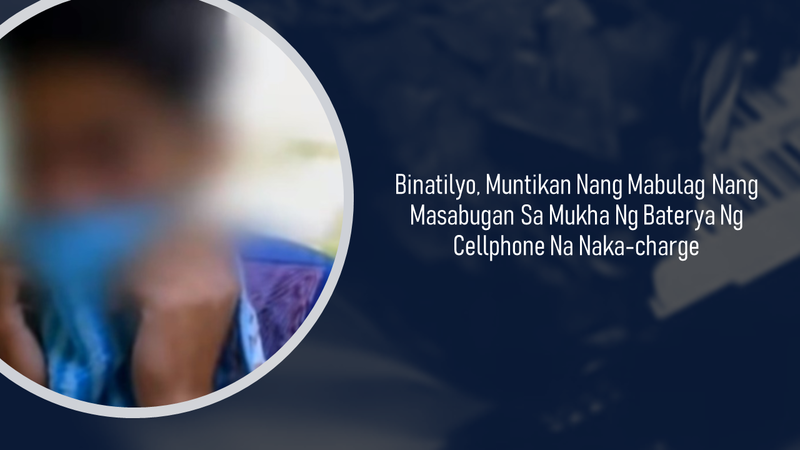 According to Totoy, while his phone was charging, he opened the back of the phone and attempted to remove the battery. That's when it suddenly burst out and the powdery substance from the battery went inside his eyes. He immediately flushed his eyes with water and when he could not open his eyes anymore, he cried for help and he was rushed to the hospital by his family. His grandpa said that he heard the explosion followed by the cry of his grandson begging them to bring him to the hospital In fear that he got blinded. According to expert, the battery which mobile phones are using known as lithium-ion batteries which are efficient for mobile devices are highly pressurized and are prone to exploding especially when punctured especially during charging. Experts warn people to avoid using the phone while on charge and never lave it under your pillow especially when charging. They also remind the mobile phone users to refrain from using faulty wall sockets. Using substandard accessories especially the charging cable and charging blocks to avoid putting your life and property in danger. Heed warnings and precautions for your own safety and the people around you as well. Spread the word!